1. 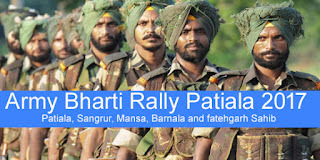 An Army recruitment rally for the candidates of districts Patiala, Sangrur, Mansa, Barnala and fatehgarh Sahib will be held from 01 AUG 2018 TO 13 AUG 2018 . 2. Online Registration has commencened from02 JUN 2018 TO 16 JUL 2018 Candidates can apply online at www.joinindianarmy.nic.in. 3. Run will be intimated to the respective candidates by email to their regstered emal IDs. 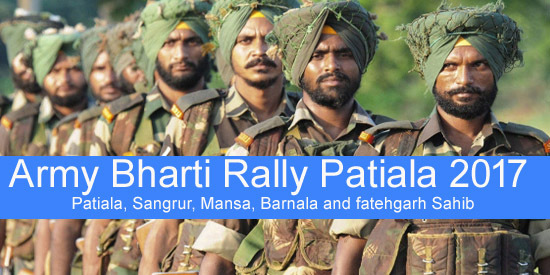 Candidates shall take printout of the Admit card and bring along with all relevant documents to the Rally ground. Unmarried certificate issued by village Sarpanch District administration within six month. Having 'O' level computer certificate issued by DOEACC Society.